I’m road tripping through southern Poland at the moment, so we’ll see if this autopost function works. My previous experience with it does not make me hopeful. So you know how in the last few days before vacation you find yourself frantically trying to use up anything and everything perishable in the fridge? Luckily Dorie gave me permission by stating that this week’s Vanilla Vegetable Salad could be made with any veggies. In my case that meant an abundance of carrots in various colors. Which is why I wished that I had liked this salad more so that I could use up the rest of those carrots. As I write this (one day before hitting the road) I am still wondering what the heck to do with the rest of them. I’m thinking that my husband is going to be tired of carrot sticks long before we hit the border. But back to the salad. This was an insanely simple recipe made with a very basic vinaigrette with one very surprising ingredient, vanilla extract! Now, I didn’t dislike the vinaigrette. It was actually nice with a very subtle vanilla nuance and perhaps I will pull this recipe out again for guests. But I also didn’t love it enough to warrant the use of such an expensive ingredient on a regular basis. As for the other ingredients, I learned this week that I don’t like purple carrots. The ones I had were very hard (as in, my jaw got tired chewing on them) and very bland. Seems to me that they are meant to look pretty but do not contribute in any way to the flavor. Did I just get a bad batch? Hope everyone is having a good week. I look forward to catching up and learning what the October recipes are when I get back. The auto-post worked. I think WordPress ironed out some of those kinks in the recent updates. I haven’t tried purple carrots… here’s hoping your batch was the exception. I enjoyed this recipe – it’s always good to have an easy salad dressing in the back burner. I like the purple carrots! Glad you enjoyed the vanilla. I was not a fan. Hope you are having fun in Poland! Hope you are having a splendid road trip! Your purple carrots are gorgeous…too bad the taste didn’t match their beauty! Enjoy your travels! I agree. This one was interesting, but not necessarily enough to make it again. I wonder whether the purple carrots taste better cooked. They are pretty. Can’t wait to hear about Poland. Hope you are having a fantastic time. Those carrots are gorgeous. You are the third person that I read that said subtle for the flavor. I found it so strong. Maybe I’m vanilla sensitive. Hope you are enjoying Poland. I think it’s definitely a dinner party dressing. I like purple carrots, at least the ones I get here, but I usually use them for roasting, so I haven’t noticed that they’re especially chewy. Enjoy your road trip! I just had rainbow carrots at a friend’s house which they had roasted. I thought the tasted great so much so that I went out and bought a bag. I am going to use them for the double carrots and monkfish we have coming up. We did not love this salad and will probably not make again. Have fun in Poland. 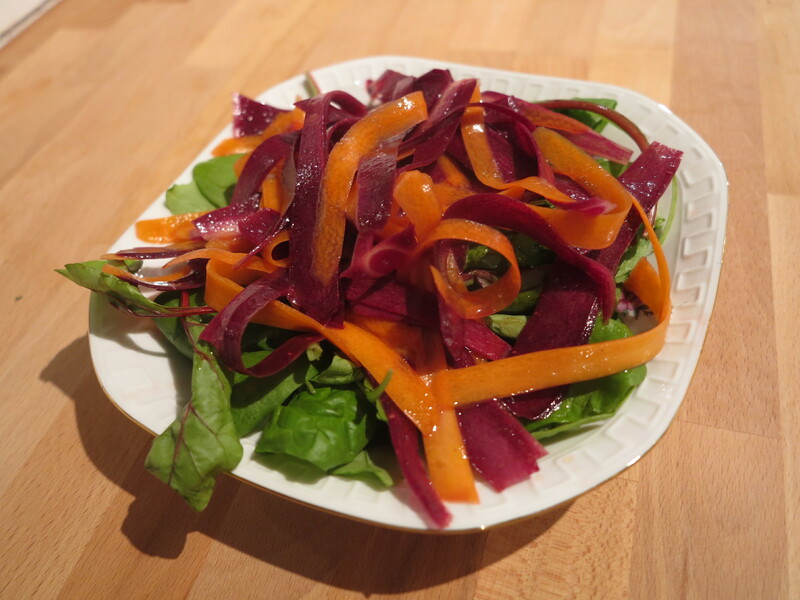 Your salad looks pretty, even if the purple carrots were not great. Happy travelling! Interesting about the purple carrots Rosa. I’ve never tried them. I wasn’t crazy about this salad either. Enjoy Poland!